Enjoy the taste of a refreshing mojito cocktail minus the empty calories. 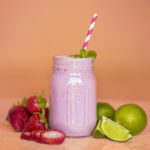 This Vegan Strawberry Mojito Shakeology smoothie recipe recreates the flavors of the drink with mint, sparkling water, and fresh lime juice. But unlike a rum-spiked mojito, this smoothie is actually good for you! Don’t have Shakeology yet? Get all of the Shakeology flavors here. Enjoy the taste of a refreshing strawberry mojito smoothie! Place ½ cup water, ice, Shakeology, lime juice, lime peel, and mint in blender; cover. Blend until smooth. Pour into serving glass. Add remaining ½ cup water; mix well. Garnish with mint and strawberry slice, if desired. Enjoy as part of breakfast or as a snacktional. If you have questions about the portions, please click here to post a nutrition question in our forums so our experts can help. Please include a link to the recipe.